wanderlust ATLANTA: Grease is the Word! When was the last time you went to the drive-in? NOW is the time to resurrect that long-lost tradition or treat yourself to it for the first time. Grease, now playing at Serenbe Playhouse, is a most magnificent rendition of the beloved musical and movie by the same title...it's the one that you want! I'd never seen the musical on stage, but I love the movie. In talking with friends who have seen both, this production, as I understand it, follows the movie more closely...thus the magnificent drive-in set design. Upon arrival—when parking your car—you're enthusiastically welcomed to the first day of school at "Rydell High". One of the things that I love about Serenbe Playhouse is that the "support" staff you meet before the show and during intermission are the actors you'll see onstage. If it's your first time to a Serenbe Playhouse performance you might not get that—I didn't—but the giveaway is that they're in costume and in character. Such great fun! This show felt like a family reunion! So many of the cast I've met and seen perform at Serenbe Playhouse and other Atlanta theatres. 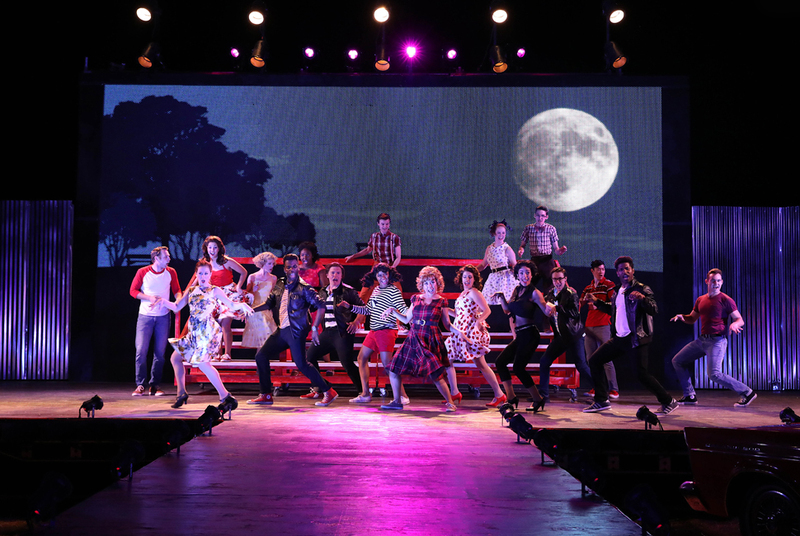 The show has a huge cast, and is a colossal collection of talent! 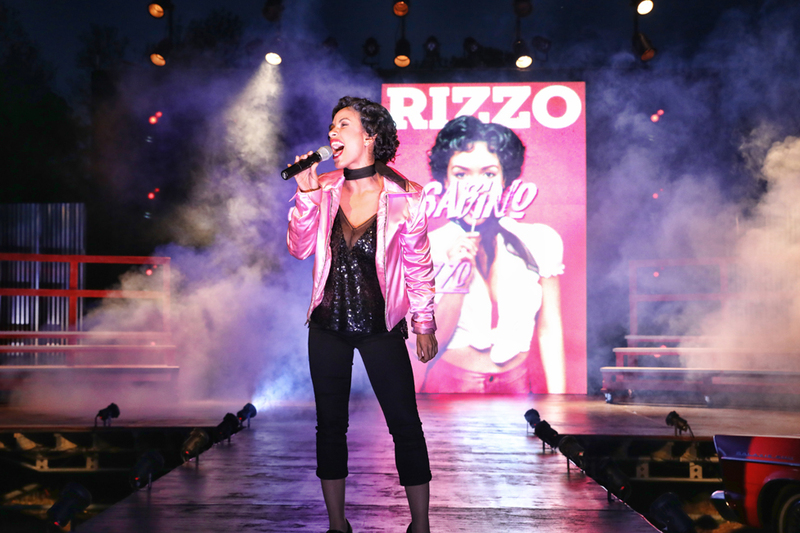 Opening the show is a personal favorite, Julissa Sabino (Rizzo), who gives a rhapsodic performance of "Grease is the Word". Rizzo is my favorite character in the movie, so it was super exciting to see Julissa in that role! Hands down, the best numbers in the show were the group numbers. 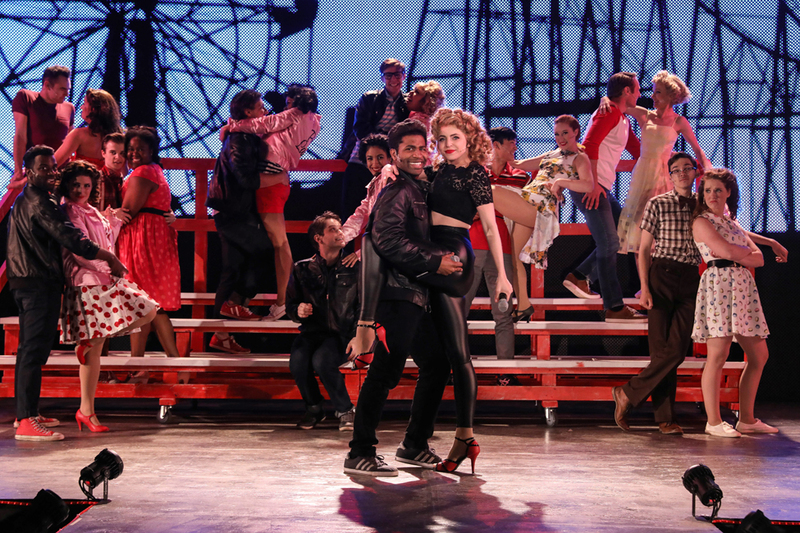 This cast performs like greased lightning! The show is fast and their energy high...pay attention or you might miss an important line, or worse, you might miss a punch line! Also, they're family...theatre family, which is a bond unlike any other that I've ever seen. The whole of the Atlanta theatre family is close. If you've not been to a Serenbe Playhouse performance before, know that it's an outdoor theatre, and each new play is in a different location. Grease is set in a "drive-in", the front row being classic convertibles and a truck! Those VIP "seats" get car-side service, too! The GIANT movie screen was part of the performance. In many scenes there were graphics, classic drive-in animation, or pre-recorded scenes that nestled perfectly into scenes playing out on stage. The choreography and editing between live actors and on-screen performance is truly brilliant. Oh, and there will be a full "moon", or two, every performance. Michael Stiggers (Danny Zuko) is brilliant! He's not only a wonderful actor, his voice became exponentially impressive and wholly magnificent throughout the performance. I met him at an industry event earlier this week...what a delightful human being! Randi Garza (Sandy Dumbrowski) sings as beautifully as she is gorgeous. Of the solo performances, Randi's mesmerizes the audience...she's spellbinding. I also had the pleasure of meeting her and she too is delightful. "You’ll find it hard to resist breaking the rules with Rydell High’s spirited class of gum-chewing, hub-cap- stealing, hot-rod- loving boys in leather jackets and their wise-cracking girls in poodle skirts. 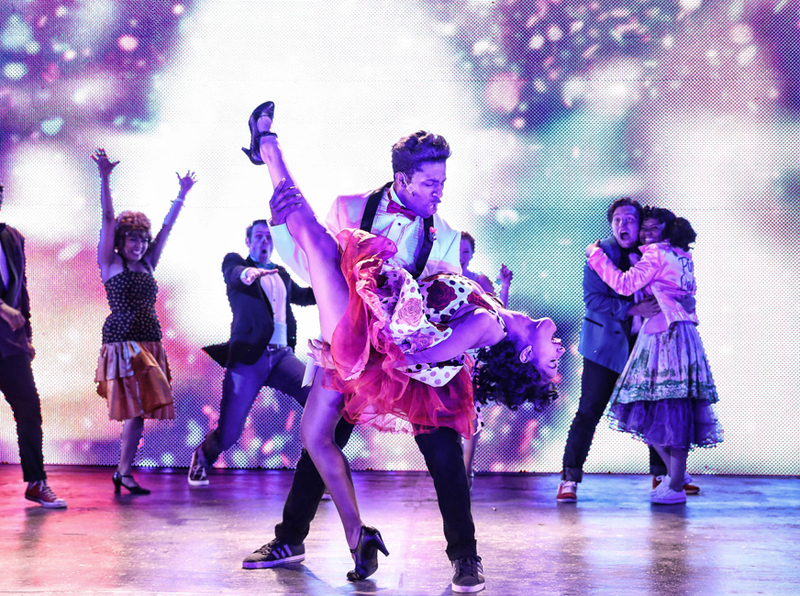 Step back in time in a unique setting that will evoke memories of a drive-in movie..."
I've had the great pleasure of seeing more than half the cast perform in other shows, many of them award-winning! I've also met quite a few of them—at opening night receptions, industry events and at the theatre seeing each other's shows—and every single one of them is personable, friendly, appreciative...wonderful people! 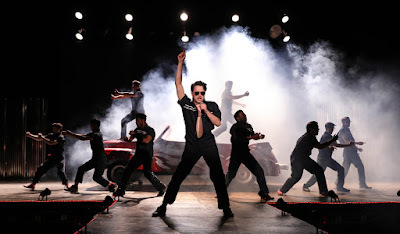 Grease will be playing at Serenbe Playhouse through Sunday, April 16, and there's an American Sign Language interpreted show on Friday, April 14. Performances are Wednesday through Sunday at 8:00 p.m.